FOR reasons nobody can remember now, Conservative councillor Andrew Mennear always used to vote against the minutes of the full council meetings being signed off. It became a running groan from the rest of the chamber, as he would stand up and say he did not agree. Yes, when the historians of a future century are piecing together what we were all doing in this room, mystified by local politics no doubt, Cllr Mennear’s name will be there in the ink, the man who voted against the minutes being signed off. Future generations of Mennears will feel proud. It was perhaps appropriate then, that the final act of this stickler’s long service as a councillor – he’s stepping down – should give us a typically Mennearish end to this four-year council cycle. The last thing to happen in the last meeting of his last term as a councillor was for Cllr Mennear to take to his feet one final time and ask for standing orders to be suspended and for the session to be extended from a 10pm finish to a 10.3opm. The Labour majority outflanked this idea with a show of hands, declining the opportunity to debate and vote on a motion calling for weekly bin collections to be restored. Camden’s full council meetings are pretty rigidly set for three hours, unlike local authorities elsewhere where these kind of meetings can run all afternoon and evening with the need for dinner breaks in between. Camden’s way of doing things means the format can be susceptible to filibustering if there is an awkward motion ahead, but it also ensures everybody has the chance for a nightcap before bed, should they so wish. And even Cllr Mennear could be convinced for a final dram in the Skinner’s on this emotional last night of the proms for departing councillors. TV fans, do you remember back in 2000 when Richard Madeley and Judy Finnigan, from This Morning, won some award and as they accepted the going, Judy’s top fell down in front of everyone. It was quite a scene. Not too long after that, a very, very similar thing happened to one of our councillors while they were speaking at a full council meeting. Whoever was editing Camden Council’s webcast at the time kindly cut this unfortunate episode from the record and it was never mentioned again. Meddling with the film of these meetings is a rare thing, as far as we know. So Leila Roy, the Conservative councillor who raised the issue of a knife incident in a primary school on Monday evening, joins a select group of local politicians to be censored by its editor. Providing a little too much detail about the case, part of her contribution has been silenced after legal advice. 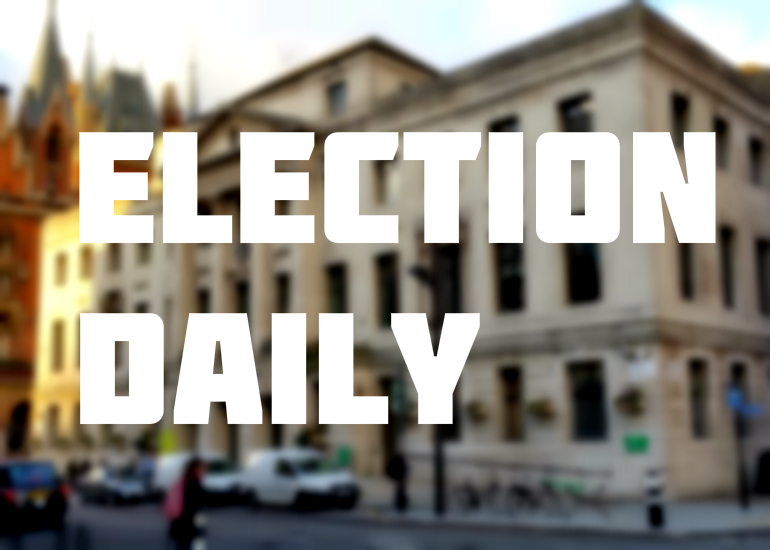 YESTERDAY the Election Daily reported that Labour councillor Sabrina Francis was a contender for what seemed to be an uncontroversial run to be deputy mayor. It didn’t take too long for a text or two to come through explaining that the picture is a little more crowded. It could go to a vote at the Labour group’s annual general meeting in May, if talk of interest from Maryam Eslamdoust, among others, comes true. CREDIT is due to the Town Hall leadership for trying to change Camden’s full council meetings, the tedious nature of which were the subject of endless posts on these pages. While there are still a few councillors who spend nearly the whole three hours staring at a phone or tablet (but somehow expect everybody to be attentive when they are on their feet), the sessions have had an injection of energy with more targeted debates and public interaction. Monday’s meeting was a good example where speakers on knife crime gave eye-opening and useful contributions which should’ve been a help for all of our local politicians. No wonder that both Camden mayor Richard Cotton and outgoing Siobhan Baillie suggested these passionate speakers should consider running for a seat at the Town Hall themselves. I think Cllr Baillie was referring to singer Gemma Fox, one of the founders of Save Our Boys, Save Our Girls, a group resolved to tackle knife crime in Queen’s Crescent, when she suggested a “future mayoress of London is in the room”. Ms Fox is definitely worth a listen because she is Camden through and through. Lots of people will remember her father, Wally, who used to drive the 24 bus and throw darts in the Mitre. It seems a long, long time ago now but I interviewed her on the Camden Lock bridge in 2004 after she was nominated for a MOBO – and she was a determined enough spirit then. ‘Award hopes of the star who relishes a struggle’, the headline read. She was talking about celebrating Camden for its best bits back then, while also tackling its historic problems with drugs and gangs. Credit to her, then, that’s she still here fighting. On Monday night she was offering suggestions – maybe even solutions – rather than just drawing the problem. And if Save Our Boys delivers even half the things it has pledged for young people, then it will be an important resource. “We don’t just want to be here for five minutes,” she said. WITH councillors who are repeatedly re-elected, it’s easy to chart how long they’ve been a part of Camden’s political tug-of-war. Green councillor Sian Berry may have only served one term at the Town Hall, in the split ward in Highgate, but the photos from the 2002 local election count show she’s been in the mix for a lot longer than most councillors in the chamber. Labour canvassers are chasing her seat (and that overall wipeout of the opposition), but expect a few split ballot cards in N6. A ward to watch on May 3.